Days after a federal agency accidentally released millions of gallons of contaminated mine water into a major waterway, neighboring local businesses are speaking out about how the incident impacted them. On August 5, the U.S. Environmental Protection Agency mistakenly discharged more than 3 million gallons of polluted water from an abandoned mine into the Animas River, a tributary of the San Juan River in southwest Colorado. 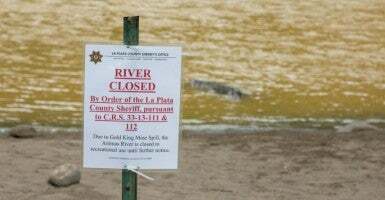 In the interest of “public safety,” local authorities in La Plata County, Colo., closed the Animas River to all watercrafts. The restrictions have deeply affected a region that relies heavily on the river for agriculture and tourism. Roger Zalneraitis, executive director of La Plata County Economic Development Alliance, told The Daily Signal that a number of small businesses, including real estate agents, ranchers, farmers, water sports, and even a photographer are feeling the spill’s impact. He said the long-term impact is less certain. “It is very moving when you realize most people contacting you express more interest in the well-being of those they provide for, than for themselves,” Zalneraitis said in an email. For now, attorneys general from Colorado, New Mexico, and Utah have joined together to fight for compensation for communities affected by the spill. “We have to be vigilant as attorneys general, as the lawyers for the state, as protectors of the environment, to be sure that the assurances we received today from the Environmental Protection Agency are the same in two years, in five years, even 10 years when we discover what the damage to the environment actually is,” Colorado Attorney General Cynthia Coffman said at a press conference in Durango, Colo.
Tom Bridge has owned a nursery and landscaping business on the Animas River in Durango, Colo., for 15 years. After the spill, Bridge immediately shut down his irrigators, which pump water from the river to his nursery. This forced Bridge to truck in thousands of gallons of clean water to keep his inventory alive. “No agency could be more upset about the incident happening or more dedicated about doing our job and getting this right,” McCarthy said. Kay James, an organic ranch owner in Durango, Colo., who works 10 miles away from the river, was able to avoid the spill because the EPA gave her adequate notice to obtain water from other sources. However, James told The Daily Signal the national attention to the incident could have a long-term impact on the area’s tourism industry. Bob Kunkel, executive director at the Durango Area Tourism Office, says the community remains upbeat. Despite the river returning back to its normal appearance, local authorities are waiting on the EPA to test the water and determine if the river is safe for human activities. Bridge doesn’t want to wait on anyone. He plans to send his own water and soil samples to Colorado State University for testing. 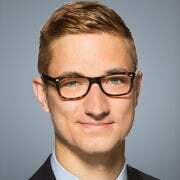 Alex Anderson is a former news producer for The Daily Signal.